I can hear readers scrunching up their noses and foreheads at the very thought. People are saying, "I've been to Price Chopper and I've had their bialys. They are fine, but how can you even compare them to Kossar's on the Lower East Side?" And I'm okay with that. Bialys are made by hand. Different bakers, even using the same recipe and the same ingredients will end up producing different results. The important thing is that on multiple visits, the specimens sold at Eastern Parkway have fulfilled a critical criterion that is missing from the famous Kossar's. Of the few changes bialys have gone through after their voyage to America none is more striking or inexplicable than the disappearance of poppy seeds. Along with the slivers of roasted onions, those tiny round gray-black seeds -- the beloved mohn -- was the feature most fervently recalled by every former Bialystoker I interviewed. And here is where our very own Eastern Parkway Price Chopper has a leg up on Kossar's, because they have poppies a plenty. Actually, the center indentation at this location is filled with the amazing flavor of raw and roasted onion commingled with sweet and nutty poppy. Our bialys in Schenectady may not be quite as pillowy along the outer rim as those produced downstate, but there is plenty of yeast in these babies as you can tell by taking a peek under the crust. 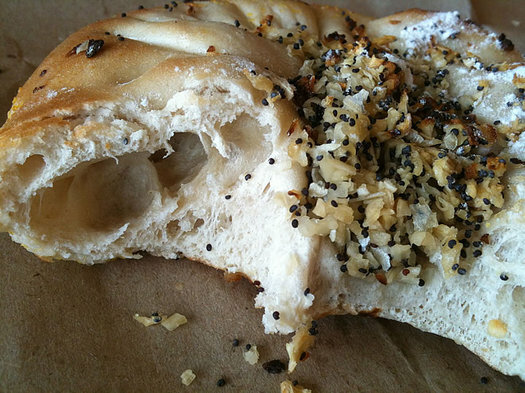 I wish I could say there was a right way to eat a bialy. Opinions on this differ. I've heard that New Yorkers like to toast them. And I've also heard that others like to slice them horizontally, and spread cream cheese or butter on their cut inside surfaces. All of these notions cause me great pain. 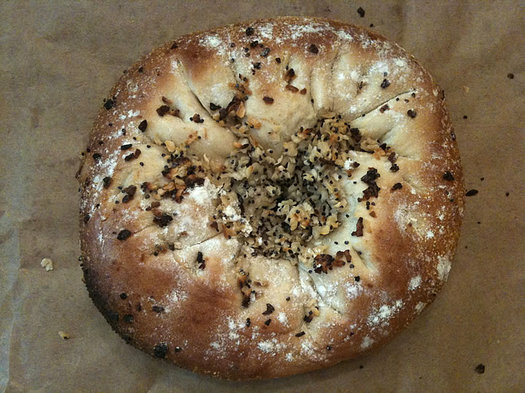 The bialy comes from a heritage of poverty. A time when every poppy seed was sacred. Slicing them in half as you would a bagel is all but guaranteed to disturb the onions and poppies. Most of the Bialystockers interviewed in the book applied any spreads over the top of the bialy, making sure to get plenty into the indentation. But I prefer mine unadulterated. Warm bialys are the best bialys, but toasted bialys are a sure way to burn the onions. The taste of modern bialy eaters leans towards lighter crusts. If you like yours a little darker, you can "finish them off" in a 500 degree oven at home. I found five minutes on the bottom rack gives added color without charring the onions. If I had a pizza stone, I might consider that to really crisp up the bottom too. Otherwise, warming them in a 350 degree oven for seven minutes will totally heat them through and keep their color and crust intact. Alternatively, you can show up at 6:30 am at Eastern Parkway when they come out of the oven, or call ahead to special order a batch of your own. The Price Chopper bialy is a steal at $.79, or six for $3.00. Are these different from Kossar's? Totally. Better? Well, that's going to be a matter of opinion. Having trained my palate on my hometown bialys, I am afraid that, despite the absence of poppy seeds, Kossar's still set the standard for me, familiarity being the seasoning that counts. Calvin Trillin once wrote that any man who doesn't think his hometown hamburger is the best is a sissy. That me be true of bialys as well. Regardless, there are people all around the world who would be envious of what is being produced in relative obscurity at one of our local Price Chopper markets. Without hesitation, I would take visitors from California and other parts of the country to this grocery store to experience a rare and delicious bialy. Downstate friends who were willing to keep an open mind might get to try one, too. Now, even at Price Chopper, these are not found in every store. They are only sold in those markets that have a self contained "Bagel Factory" inside. And even then there may be no bialys, like in Rotterdam where they stopped making them about eight months ago. So if you plan to go exploring, it's best to call ahead. But I make no claims beyond the ones at Eastern Parkway. So get to Schenectady, and stock up. It's not ideal, but you can freeze bialys and warm them up in the oven after they've been defrosted. Just don't listen to anyone who tells you to slice them in half. They are heretics. As much as I despise PC, I may have to force myself to go in and try these, maybe their bagels too..
Daniel, I'll trust you know a good Bialy so I'll thank you in advance for showing me these, even if it does mean I have to go into a PC. The bialys in Cobleskill PC are good too, and look similar to the Eastern Parkway specimens. I'll definitely have to give these a try, but may I recommend the bialys from All Good Bakers on Delaware Ave. in Albany. As a community supported bakery (CSB) they are dedicated to high-quality and local ingredients. Chef Nick is an incredible baker and has been recognized year after year as a tour d'force in the land of yeast and flour. Accolades aside though, their bialys are fantastically crunchy in the center with a soft outside and contain local onions, spices, and are just plain awesome. Hmmmmm....I dunno. I'll have to try them to believe you. Bialy party? Have always loved bialys. Dad used to buy them from Leos', and brought deli from Kagan's to our summer retreat in the Adirondacks. Saatti's brother, at the former Bagel Bite on Delaware had great ones. Just called P.C's customer service line to request bially's again! She did not know what they were, so i told her they were like a combination of a bagel,and onion roll on hormones! My paternal grand dad's family all perished in Bialystock. He came over in the late 1800's, with just a few dollars. Grand dad established the second oldest Orthodox temple in Troy. I didn't know Price Chopper had bialys. I haven't had them in years! I will have to look for them at our local PC. @JerseyGuy, I think PC bagels are some of the best in the region, actually. Definitely better than Dunkin' Donuts... and larger than the incredibly-shrinking Bruegger's bagel. I agree that Colonies PC bialys are not special. I disagree that All Good Bakers bialys are great, though they aren't bad. I'll give the EP PC a try, though I'm inclined to think that a lot of what a person loves about a somehing is in the memory and what surrounds the memory. I'm a long way from home here and though the recipe may be the same, the bialys (or the bagels) just don't taste the same. Thanks for the recommendation, Kristoph! Nick prepares our bialys fresh, every Wed-Sun morning with Organic hi-gluten flour, red star yeast, kosher salt, organic olive oil and local caramelized onions. 1.25 each! He spent months perfecting his recipe/methods until he achieved the approval of his taste tester, a Jewish friend from Brooklyn. Come on over to 540 Delaware to try them! wed-fri 8am-3pm, sat/sun 9am-3pm. I don't doubt that may be tasty, but it looks like a loaf of bread covered in bugs. Daniel B., this is going on the list of "things to try ASAP." Thanks for the thorough review, and I love the photo spectrum! @Britin -- I'll jump in and maybe Weenie girl will add her 2 cents. I've bought the bialys at All Good 3 different times. The first two times I thought they were dry and I would not have bought them again. This morning I bought one (prompted by this post and I was in the neighborhood) and while it was fresher, it was lacking in onions. So my constructive criticism is the need for more onion flavor. 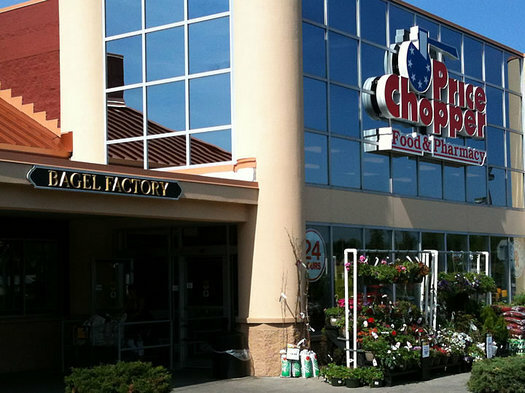 It's nice to see Price Chopper given credit where credit is due. No other supermarket around here goes to the trouble of making bagels or bialys from scratch. I'm happy to say that I've eaten Price Chopper bialys from more locations than Daniel and have never had a "bad" one, though I agree that the shape differs a bit here and there. That's why I was surprised to see the good-bad scale under the photos, which implies that any one of them is 'bad'. Whether this is a careless error or an intentional slam, I don't know, but it strikes me as disingenuous to have concluded that only one location out of 17 has "good" bialys. Fascinating! I always though a bialy was just a kind of bagel. How wrong could I be? And poppy seeds! I love them. I'll walk through fire & ice to get a poppyseed pastry. And besides that, we live very close to the Eastern Parkway PC, and shopped there a lot before the Niskayuna one opened. Worth making more visits. Ever since you had this post i have wanted a bially. All Good Baker's is farther away from me now! Can AOA have a contest for a dozen biallys? OK - I agree 100% with the above (@chrisck's) assessment of AGB's bialys. @Britin - I like your breads and love to support a local business as I live in the neighborhood. 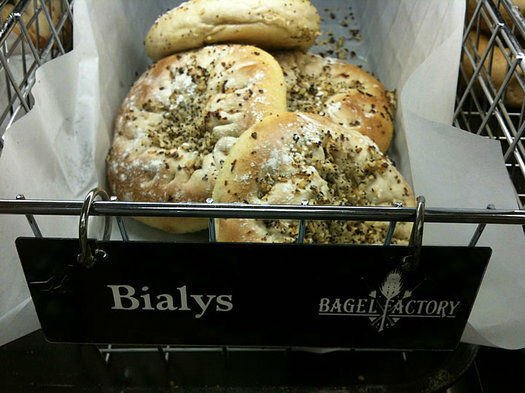 However, and I hate to admit it, but if your bialys were sold at a non-local business (e.g. PC or Hananford) I would not buy them. A little dry, and a lot lacking in the onion department. If you see Daniel's picture of the PC bialy above - that is how yours should look. your other items are great so I am confident you can step up your bialy game a couple notches and blow PC out of the water! when the voohriesville supermarket was family owned, they made bialys that were incredible, of the same caliber as NYC bialys and better than PC. those from eastern parkway sure look good however. I spotted the bialys at my local PC this morning. With fond memories and thoughts of this article, I was about to grab one when I realized it had cheese on it. Cheese? Sorry couldn't go there. weeniegirl, chrisk and delso res: I passed your comments onto Nick and he immediately has begun to add more onions. I'll talk to him about brushing them lightly with olive oil to combat the dryness problem (he used to do that, not sure why he stopped). I'll also ask him about adding more varieties! Hope you'll all stop in again to try the improved versions and we really appreciate you being willing to give us your feedback. Thanks for supporting AGB. got a bialy from all good bakers at the saturday delmar farmer's market and i must say it was delicious, not dry at all, not salty as was the one i tried when they first were at the market. and thanks for adding more onions, as it definitely needed more. Like the Man of La Mancha i am in quest for the great bialy! Where there is life there is hope one will find it's way to me today. I second the PC-Eastern Parkway bialy recommendation. We've had our first batch from there, and we'll be going back for more. They're utterly unlike biagels, and that's a first for me. Most of the others have been JUST like bagels except the doughnut hole (bagel hole?) doesn't go all the way through. But the ones from PC-EP have a totally fdifferent flavor and texture. Marvelous! To continue this, from my recollection of bialys from a bagel/bialy factory in the Bronx in the 60s, all good baker's is what they should look like. Not a puffed up one like PC, although they are better than none. That goes for all the puffed up bagels everywhere..size is not everything.